GLENDIVE, Mont. -- Truckloads of drinking water were being shipped to the eastern Montana city of Glendive on Monday after traces from a major oil spill along the Yellowstone River were detected in public water supplies, raising concerns about a potential health risk. Preliminary tests at the city's water treatment plant indicated that at least some oil got into a water supply intake along the river, according to state and federal officials. About 6,000 people are served by the intake, Glendive Mayor Jerry Jimison said. Officials stressed that they were bringing in the shipments of drinking water as a precaution and did not know yet whether there was any health threat. Results of further tests to determine the scope of the danger were expected in coming days. Up to 50,000 gallons of oil spilled in the pipeline accident Saturday. Cleanup crews trying to recover the spilled crude were hampered by ice that covered most of the river, making it hard to find the oil. An advisory against ingesting water from the city's treatment plant was issued late Monday. After hearing about it, Glendive resident Ed Miller, 67, picked up an extra gallon of water from the fast-dwindling supplies at a convenience store. Miller hadn't noticed any odors from his own tap water. But his neighbors had, and Miller said he wouldn't be drinking any city water until the advisory was lifted. Officials with Bridger Pipeline LLC of Casper, Wyoming, have said the break in the 12-inch steel pipe happened in an area about 5 miles upstream from Glendive, an agricultural community in east-central Montana near the North Dakota border. Bridger spokesman Bill Salvin said Monday that the company is confident that no more than 1,200 barrels - or roughly 50,000 gallons - of oil spilled during the hour-long breach. An oil sheen was seen near Sidney, almost 60 river miles downstream from Glendive, said Paul Peronard, the on-scene coordinator for the U.S. Environmental Protection Agency. Booms were being placed in areas of open water to try to trap oil. 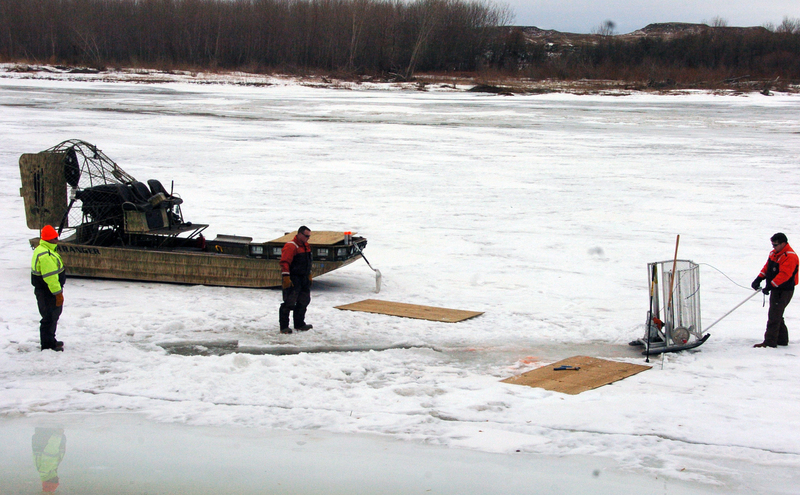 Near Crane, which is about 30 miles downstream from the spill, crews were chopping holes into the ice in hopes they would be able to vacuum up crude as it comes down the river in coming days. "These are horrible working conditions to try to recover oil," Peronard said Monday. "Normally you at least see it, but you can't see it, you can't smell it. ... We're going to have to hunt and peck through ice to get it out," Peronard said. If it happened on the bank, some of the oil may be trapped in the soil near the river. If it was beneath the river, "Then it's all in the river," Peronard said. He said the impact of someone being exposed to the contaminated water is probably different than long-term chronic exposure would be, reports CBS Bozeman, Montana affiliate KBZK-TV. Long-term impact is considered more dangerous. Montana Gov. Steve Bullock toured the spill site Monday afternoon. He said he expected Bridger to continue its cleanup efforts "until it's cleaned up to our standards." "The water's a concern," Bullock said. "I expect Bridger to continue and provide all the resources needed." The pipeline receives oil at the Poplar Station in Roosevelt County, Fisher and Richey stations in Richland County, and at Glendive in Dawson County, all in Montana. It was last inspected in 2012, Salvin said, and is at least 8 feet below the Yellowstone River bed where it crosses the river near Glendive. Bridger Pipeline, a subsidiary of True Cos., also owns and operates the Four Bears Pipeline System in North Dakota along with the Parshall Gathering System and the Powder River System in Wyoming, according to the company's website. The company will not be able to restart the pipeline until it receives approval from the U.S. Department of Transportation's Pipeline and Hazardous Materials Safety Administration. Inspectors from the federal agency were at the spill and also planned to inspect Bridger Pipeline's control room in Casper, Wyoming, to gather more information, PHMSA spokeswoman Susan Lagana said.